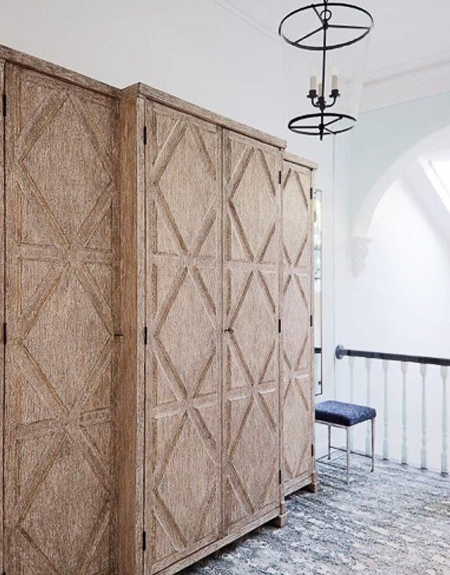 Our Flanders Cabinet was customized and turned into a Linen Press for a home in Sydney, Australia. Reinterpreted by designer, Thomas Hamel, from its original two door to a majestic four-door casegood. Photography by Anson Smart. 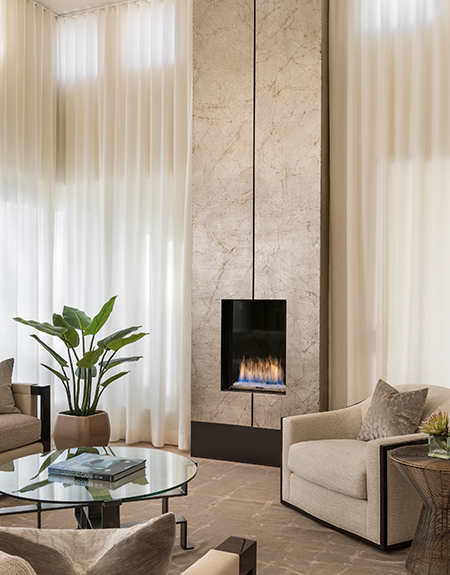 Our Alchemy wallcovering in Antique Silver Leaf was customized to wrap around a fireplace for this Paradise Valley, AZ project, designed by Lynne Beyer. Photography by Mark Boisclair. Throughout Gregorius|Pineo, there's a regard for handcrafted luxury expressed in a passion for interpretation, collaboration, and rendering of detail. Those attributes may be best expressed in our capacity for custom work. Our work with a designer through a customization project represents our sincerest desire to lend support in the creation of unique and personal environments. Whether an alteration in dimension, readjustment of scale, or even reinterpreting an existing style to meet a new functionality, e.g., console to coffee table, every item in our line is completely customizable to a designer’s imagination and specifications. Additionally, a custom color finish or an adjustment in a wood or iron texture are options for designers to individualize a piece. Customization of our wallcoverings support a designer's ability to reimagine the interior architecture of a room. Alterations in a wallcovering's dimension include our natural fiber qualities and most of our Handcrafted by Atelier plasterworks, that we have customized in continuous panels of increased height. Artisan-prepared customized colors broaden our tool box of custom capabilities for designers.